Basically, I'll post links to my past updates from ST and AIN here, and I'll do my best to update this simultaneously with my AIN CJ. (it's easiest since both have the same code). 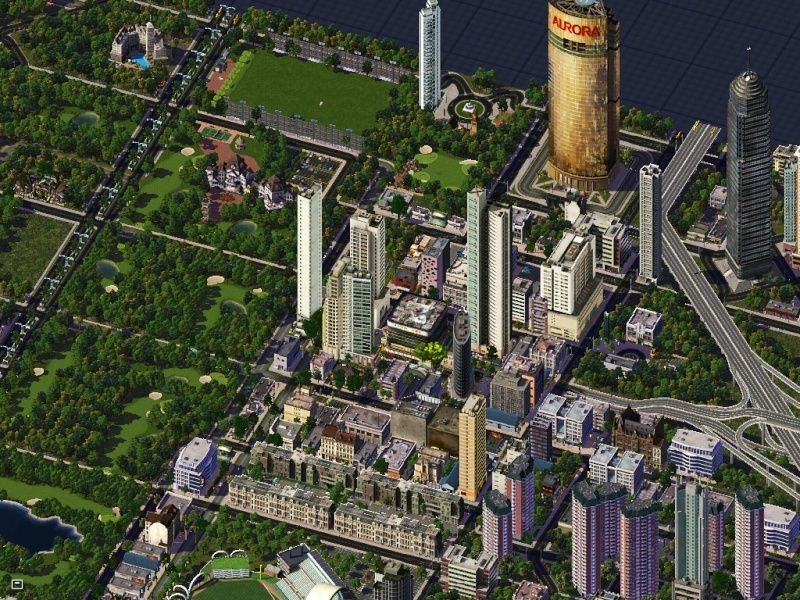 Republik Stadt, as you may already know, is my newest, and in my opinion, most realistic and well-planned city. 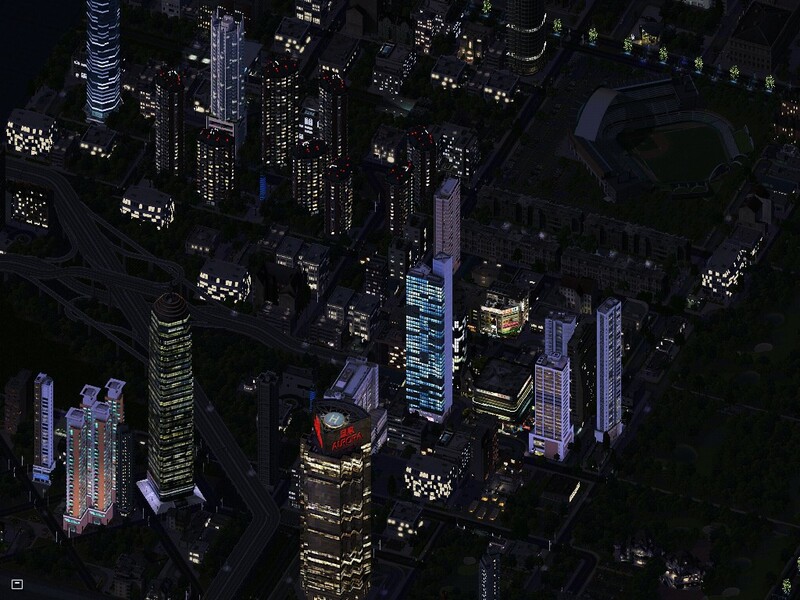 Sparked from the will to bid for Summer 2011 Simlympics, the crowned jewel of "Republic City" is Simlympic Island. The Island, which is made of reclaimed soil from the Baltic Sea, courtesy of Poland, was planned and built by Geoff Konig & Sons. The Island has 12 venues, 6 Arenas, 5 Stadiums, and 1 Marina. 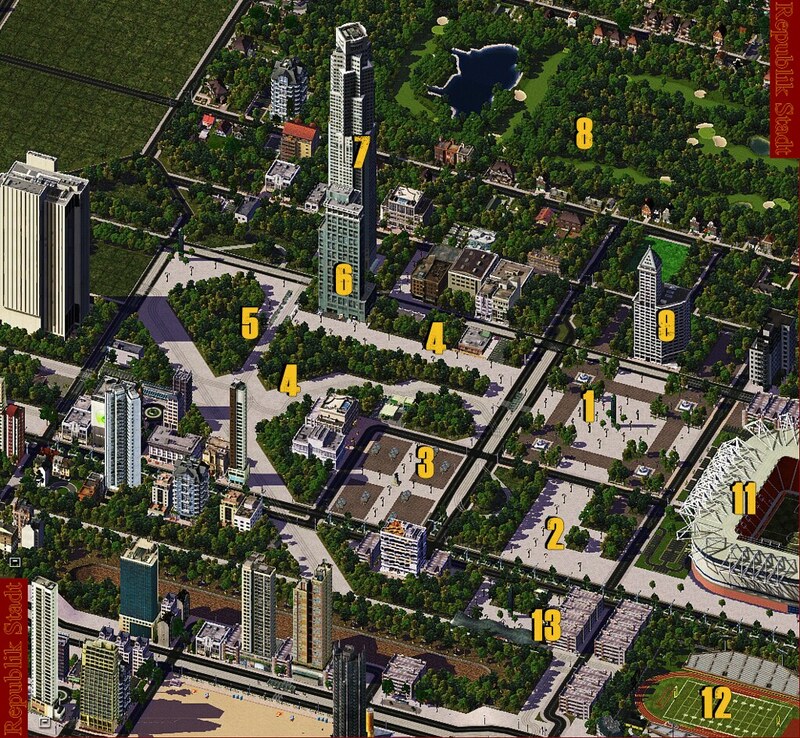 The majority of the Simlympic games will take place on the island or in Republik Stadt. All applicable finals will happen on the Island, as well as the Torch flame, Opening and Closing Ceremonies, and boat launching for Sailing events. 2:Simlympic Square Station- Aka "The Fin", the SSS is the largest and most used subway station on the Simlympic Island. 3:Neuinsel Hotel- Hotel created to house athletes and athletic trainers. Some 100 rooms will be auctioned off for charity. 4:Novus Germania MPA- Multi-Purpose Arena. While have Equestrian events, football, marksmanship events. 5:Simlympic Tennis Complex- Large tennis grounds. Has 8 practice courts, and two stadiums, one small that seats about 7,000, and a larger one that seats 10,000. 6:Gomberg Aquatics Center-Will have all indoor personal aquatics events. 7:Imperial Arena-Indoor venue which has LED screens to project various images on the roof. Will have Basketball, Indoor Track Cycling, Handball, and Badminton events. 8:Simlympic Stadium-Largest of all the stadiums. Will house 93,000 spectators when completed. Will have Track & Field and Football events, as well as the opening and closing ceremonies. 9:Prism Platz-"Prism Place" is a park area outside the Prism Platz arenas. Prism Platz has a clock plaza, as well as a subway station that serves the entire north section of the island. 10:Prism Platz Sud Arena-Indoor venue which will house Volleyball games and preliminary swimming meets. 11:Nord Insel Stadium-American Football stadium which will have American Football, Rugby, and field hockey events. 12:Undeveloped land-This area is currently undeveloped, but may have shooting events, a media center, or a park place. 13:Prism Platz Nord Arena-This northern arena, part of Prism Platz, will have basketball and martial arts events during the Games. 14:Simlympic Spire-The Spire's surrounding area includes several parking garages, as well as a bus and water taxi station, for easy access to the island from the Western coast. The Spire has an observation deck and restaurant at the top. 15:Prism Platz Station-This is a water taxi station that serves the whole island, although it is mainly used by those who need to access the Western edge of the island from the western coast of the city. 16:Flusseite Convention Center-The Flusseite Convention Center has a commanding view of the city as well as the river. It will house Gymnastics, Martial Arts, Badminton, and Handball events. 17:Simlympic Basin-This large canal may be used for rowing events or ope swimming, but will definitely be a decorative piece for the island. 18:Staging Area/Spectator Tents-These tents will be used as staging areas for open swimming and rowing events, if used for those events, and may also be spectator areas. If not used for events, the tents will be meeting areas and medal distribution areas. 19:Media Square-This plaza area features several large TV screens to broadcast sports coverage during events, and slideshows during off time. It has tables, chairs, and benches for relaxation, and is served by a small cafe for patrons. 20:Media Square Station- MSS is a subway station that serves the central area of Simlympic Island. 21:Saathoff Simlympic Ballpark-This baseball stadium will house baseball and softball events. 22:Privateer Marina-This Marina will be the boat launching area for Sailing events. 23:Simlympic Medical Center-The SMC is the hospital that serves the Simlympic Island. It has good amounts of parking, as well as ambulance service and fair amounts of emergency and clinic rooms. 24:Simlympic Visitors Center-The SVC is the recently built visitors area that all Games patrons should be sure to stop by. It has many restaurants and stores, and features a Simlympic Pavilion which has information on the Games as well as the Park. The SVC also has press rooms and the store room for almost every piece of equipment used in the Games. Another important area of Republik Stadt is the Oranje Park Recreational Complex. OPRC spans most of the Northwest quadrant of Republik Stadt. The Park was designed by Parker Urban Planning, a local start-up firm. The Park was initially supposed to be another, yet smaller, business district, but was converted mid-design to be a beutification project. The initial plan is represented in the construction of some high-rises, such as Gruneturm and Oranje Plaza. The OPRC will be a pleasant walking and relaxing area for patrons, and will have large TV screens which will broadcast Simlympic events. The Complex will expand West towards the Republik Rot Pavilion and the preliminary Tennis Complex. 2-Weisswalk: Walking area and plaza; connects to Union Station, Oranje Park Stadium, Grauwalk Park, and Union Field. 3-King Ludwig von Hekli Platz: Statue of the first King of the Tirnland, has seasonal market, known as the Ludwigmarkt, on sandstone plazas. 4-Weiss Koridor: (top) Civilian walking path to the Gruneturm, shopping stores, and Wald Station. 5-Wald Station: (lit. Forest station) Ground Level Rail station in the OPRC. Serves Gruneturm, Oranje Plaza, and the nearby shopping district. 6-Gruneturm: Houses a small mall, as well as the Oskar-Vausky Hotel. The "Fruiticious Frog" bar is a favorite of the locals. 7-Oranje Plaza: Large office tower. Contains offices for upper club management of Knights FC, several law firms, and the offices of the Imperial Chronicle. 8-Republik Fields Golf Course: The RFGC is home to the Imperial Golf Tour, which is the premier tour of the Tirnreich. Also one of the only country clubs in the capital district. 9-Fields Building: The Fields Building, which is situated right on Grauwalk Park, houses a lower levels shopping area, offices for several companies, such as Fields Electronics and Gaeber Automotives, and has penthouses on the upper floors for rich tenants. 10-Oranje Center: This business block has 4 office buildings which were built somewhat recently, with the tower visible housing the offices of Knights FC and Oranje Park stadium management. 11-Oranje Park: This stadium seats about 20,000. It offers a playing venue for the Republik Stadt Knights FC, which are her only tenants at this time. 12-Union Field: This American Football stadium was built in the early 90's, to house a recreational league of American football players, and was also used for rec soccer. It was the only track & field venue for a two decades, until, now, Simlympic Stadium is being built. 13-Union Station: This GLR station serves Union Field, the Weisswalk, Oranje Park, and the Kappens Park neighborhood. It's signature element, a 5 meter tall clocktower, offers the time, but also weather and current news, as well as sports coverage via 4 LCD TV's. Aurora Plaza (foreground)- Houses offices of Aurora Economics, a Chinese marketing firm. Nordturm Complex (near left side)- Four tower housing complex. Also has office tower on West (right) side of the block, right in front of the RSBC. Republik Stadt Broadcasting Center (Near left, Large tower)- This tower, characterized with orange rings around the top spire, which is adorned with satellite dishes, the RSBC is home to the Republik Times newspaper, AINTv center, as well as the Republik Stadt offices of the Imperial Chronicle, Tirnlander Sports Magazine, and TIME Magazines. It is also the primary news broadcasting center for Tirnlander News Channel. Zentral Marktplatz (CBD, Center)- The main business area of Republik Stadt is located between the "Flugweg" Expressway, N. Eil Memorial Baseball Stadium, and the OPRC's Republik Fields Golf Course. It features lots of shopping among the low and mid-rises, but also offices in the high rises. The Hotel Marktplatz is the only hotel within this neighborhood. Rotturm Estate (Upper left-center)- This is the Rotturm Estate (Red tower estate). As of now, it is a large hotel complex, that will house athletes (Ost Block-left) and Coaches and Officials (West Block-Right). Also seen (large grey tower) is the Estate Hotel, which houses a hotel (Conrad Hotels) and Estate offices. As with my attempt to get more in-depth with my soccer league, I will be adding 2 new football teams to the Imperial Fussball Verband, the Tirnreich's premier football league. For my sake, please vote for only two, and record which clubs you voted for. Because voting is not available for individual posts, and I don't want to clutter the Admin's boards as they try to clean up, I request that all willing participants reply to this post with the name(s) of the club(s) they are voting for. Haha well the Mokolo Warriors have a huge following, as they are a popular team in the Jumaanian Football League.